This article was written by Howard Cook, one of the founding members of the International Code Council committee that wrote Standard Plan A. Standard Plan A is a regional guideline and is used by some Bay Area building departments, the California Earthquake Authority, and the San Leandro’s Retrofit Workshop. On this webpage I will attempt to prove that Standard Plan A is an outdated, inefficient, and expensive system that provides inferior retrofits.The other way to perform a retrofit is by using the base shear formula. This formula is the engineering behind Standard Plan A and what it is will be explained shortly. Here is a cost comparison. Below you will find a detailed and technical analysis of Standard Plan A and its many flaws. You may want to jump straight to the conclusion at the bottom of the page. 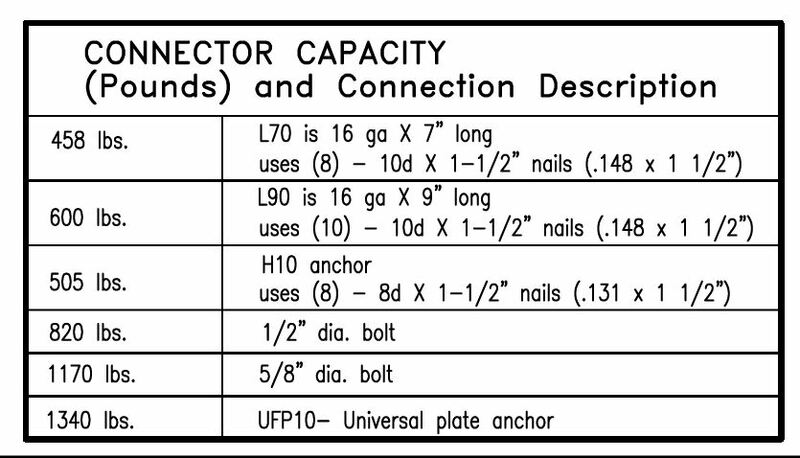 This table found in Standard Plan A gives the earthquake-resisting capacities of various types of hardware measured in pounds of resistance provided. For example, according to the first row a L70 shear transfer tie can resist 458 pounds of earthquake force pushing against it before it fails. Table 2 below shows the actual value found in the 2018 manufacturer’s catalog which is 740 lbs, a difference of 282 lbs. A 25% difference. In Table 1, an L90 shear transfer tie can resist 600 lbs. of force. In Table 2 it can resist 925 lbs of force, a difference of 325 lbs. Another 25% difference. An analysis of a home’s retrofit requirements is based on a correct understanding of the hardware required. Inaccurate understanding creates inaccurate retrofits. In this case it increases the cost of a retrofit. Table 1 mentions an H10. H10 hardware is no longer made and has been replaced with H10A hardware for new construction H10AR hardware for older homes. For the H10 hardware Table 1 specifies (8) – 8d x 1 ½” 8d nails. Neither the H10A or H10AR hardware uses this size nail. Contractors will automatically choose the hardware that is available This is the wrong nail! and given there is no such thing as H10 this can lead to confusion. The H10A and the H10AR are very different in terms of how much earthquake force they can resist. Assuming the nail size in the table is ignored, and the correct nails are used, the H10A can resist resist 590 pounds of force. If the correct nails are used the H10AR can resist 490 pounds of force. If the incorrect nail is used because a contractor is using Table 1 the values will be significantly less. Table 1 rates the earthquake resisting capacity of a half-inch bolt as being 820 lbs. According to the American Wood Council, whose tests are the basis of the current building code, the actual value is 1119 lbs. Plate washers and Mudsill Plates increase this. Similarly Table 1 gives the 5/8 bolt 1170 lbs. 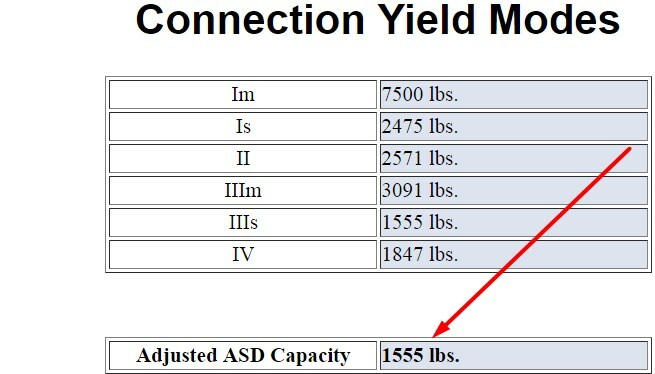 while the actual value is 1555 lbs. These actual higher values mean Standard Plan A means Standard Plan A is installing the wrong number of bolts, in this case too many which in turn increases cost. The values below were found using the connector calculator found on the American Wood Council website. This is the value for 1/2 inch bolts. This is the earthquake resistance of 5/8 inch bolts. 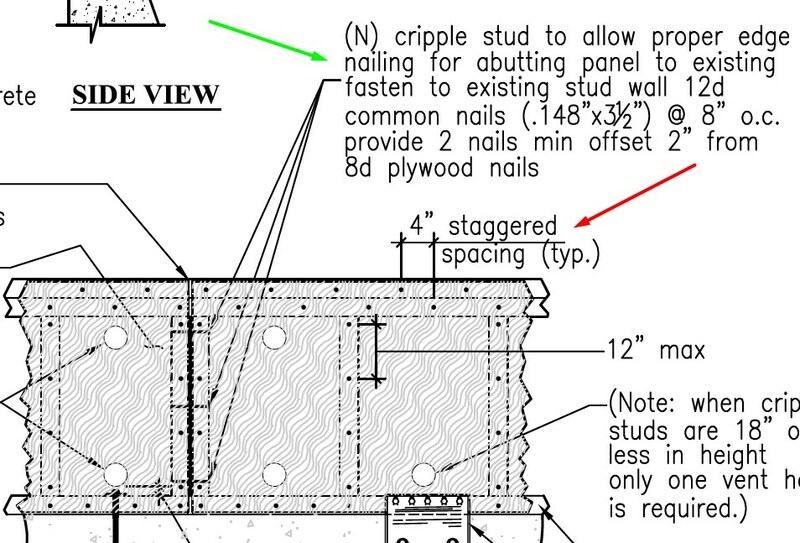 The nail spacing on the edges of the plywood in Standard Plan A is highlighted in green. This nail spacing means type 8d nails are to be put 4″ apart on the edges. This nailing pattern when used with RATED SHEATHING (this is another name for plywood) can resist 380 pounds per linear foot. If nailed into STRUCTURAL ONE it can resist 430 pounds per linear foot. The committee decided to use the weaker value because of a very limiting provision in the building code which at the time required parts of the wall framing be 3 inches thick if the plywood as designed to resist 350 pounds of earthquake force per linear foot. We thought that 380 pounds was close enough to 350 so we went with that. The code has changed since then and we would now be allowed to use 870 pounds per linear foot if we use 10d nails spaced 2″ apart on the edges. See red arrow. In other words, if, when designing a retrofit, decided we need 20 linear feet of plywood that resisted 380 pounds per linear foot, we could instead get the same strength with 9 feet, less than half. Using this closer nailing and higher value makes for a much cheaper retrofit because the amount of labor for each is practically the same. . Note, the author is waiting to hear back from the American Plywood Association to see if this analysis is correct. The only thing we can say for sure at this point is that this is an untested configuration. As mentioned earlier, the strength of a shear wall is dependent on the spacing of the nails on the edges of the plywood. In a cripple wall retrofit the edge is the upper top plate, the bottom edge is the mudsill, and the side edges are the 2 by 4s on each end. This nailing on the edges is called edge nailing. Edge nailing determines the strength of the plywood. In the Standard Plan A image below, the blue arrow points at the lower top plate which is NOT an edge. The green arrow points to the upper top plate which IS the edge and where the edge nailing should be. It only makes sense. The floor is going to be sliding on the upper top plate, the upper top plate will be absorbing all the force, which means only plywood nails attached to the upper top pate will do resisting anything. According to Standard Plan A the plywood should be nailed 4 inches apart staggered. See the red arrow in the image to the right. According to the drawing on the left this is done by putting one nail into the upper top plate, then move over 4 inches and put a nail into the lower top plate, then to 4 inches over to the upper top plate, etc. Nailed this way the outer boundary nailing on the upper top plate is 8 inches apart, and not the necessary 4 inches apart required for effective plywood nailing. This reduces the strength of the plywood from 380 pounds of earthquake resistance per linear foot to a completely inadequate 190 pounds per linear foot . In the illustration to the left the red arrow shows the plywood nailed 8 inches apart in the lower top plate. It shows the same nailing of 8 inches apart in the upper top plate shown by the green arrow. This is what happens when the nails are staggered. The aforementioned Nailed Blocking Method illustrates another weakness found in Standard Plan A. ON THE LEFT 2 BY 4 BLOCKS HAVE BEEN NAILE ONTO THE MUDSILL. ON THE RIGHT THE PLYWOOD HAS BEEN NAILED INTO THE BLOCKS. Staples are an excellent way to prevent splitting of the blocks and also have a very high shear capacity. The staples in this block have the strength of 35 nails. This is because blocks tend to split when nailed through the wide face. SPLIT BLOCK DUE TO NAILING INTO THE WIDE FACE OF A 2 BY 4 BLOCK. 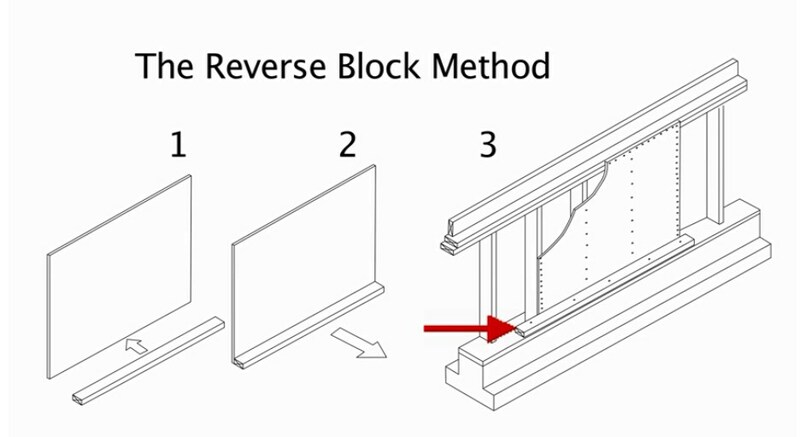 This is from an evaluation report on the 4 different methods performed by the American Plywood Association, the largest shear wall testing laboratory in the world. 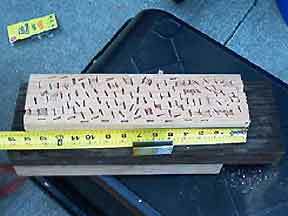 Committee members were concerned the nails would split the blocks when the plywood was nailed less than 4″ apart into the narrow face of the 2 by 4s. As shown below nails were space 1 inch apart with no sign of splitting. This further confirms closer edge nailing is a very viable alternative. So why does Standard Plan A use the most questionable untested system? I was there when it was adopted and it was a political decision. The chair of the committee had been teaching people to use nails for decades and was not about to admit he was wrong. 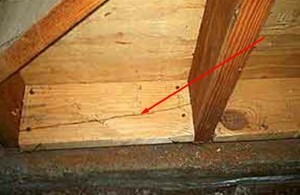 The 2001 California Building Code did not recognize plywood earthquake resistance over 380 plf (pounds of resistance per linear foot) except in very unusual circumstances. The current California Building code now allows plywood 870 pounds per linear foot, which is DOUBLE the that specified in Standard Plan A. Using weaker plywood nailing patterns from a defunct building code makes using more plywood than needed necessary. There is a big difference between 380 plf and 870 plf plywood. 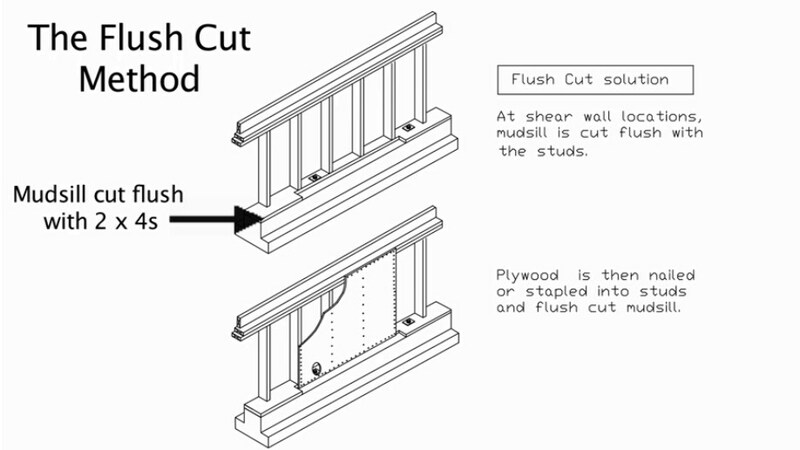 Using the stronger plywood decreases the amount of plywood needed and reduces cost. 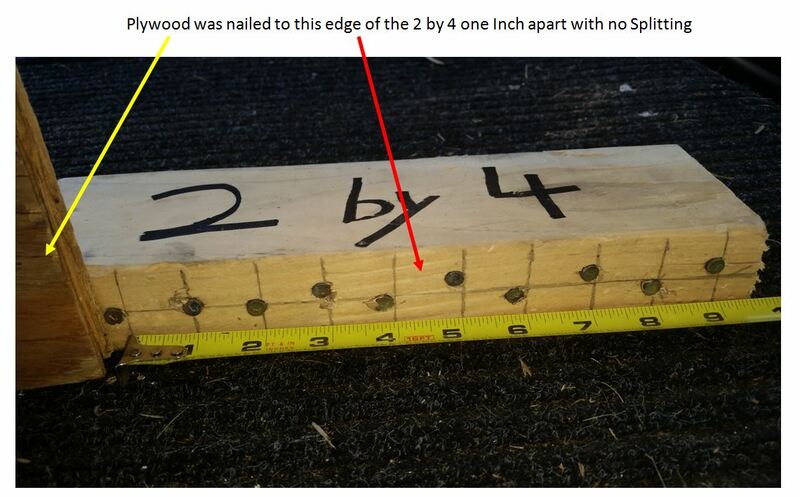 Standard Plan A calls for a plywood nailing pattern with 8d nails 4 inches apart on the edges and equals 380 plf. Double the number of nails and use structural 1 plywood and the plywood connection will be 730 pounds per linear foot. If we use 10d nails in structural 1 plywood and keep the same nailing pattern we can get an even stronger 870 pounds per linear foot. 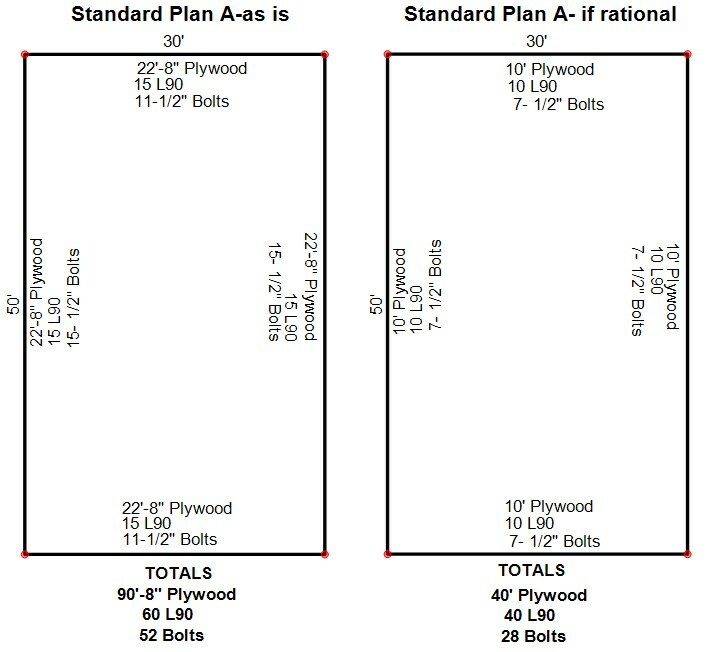 The Standard Plan A chart specifies 20 linear feet of plywood bracing on a house with stucco siding and equals 860 pounds of earthquake resistance. The current California Building Code allows 870 pounds of resistance with only 10 feet of plywood. Retrofits without cripple walls use bolt substitutes for standard bolts. Standard Plan A specifies the Simpson UFP10 for this bolt substitute. The UFP10 is no longer made. 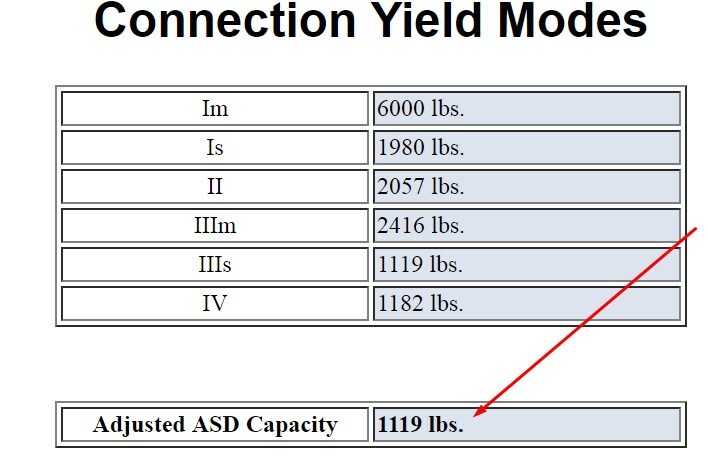 It resisted 1340 lbs of force as shown in Table 1. The available URFP and FRFP can resist 1530 lbs and 1810 lbs of force respectively Modern and stronger bolting hardware requires less hardware overall. Naturally, this will have a big impact on cost. The Hardware below is used when there is no room to put in Standard Bolts. As part of the research done by the author of this article, a questionnaire was sent out to a number of structural engineers with an average of 35 years experience. 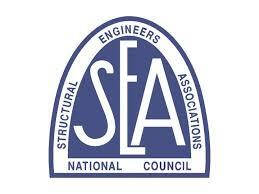 Many of these engineers lived in Southern California and had seen Northridge Earthquake damage first hand. The single capital letters are the first letters found in each engineer’s names. Below are the highlights. QUESTION: Is it true that all the earthquake force goes to the stiffest element and therefore only to the shear panels? QUESTION: If it is true that most of the force goes to the stiffest element, how much earthquake load is transferred to the part of the cripple wall that has no shear walling? L: Only a negligible amount of earthquake force transfers to the un-braced sections of cripple wall. B: The stucco has a lot of resistance but breaks apart. 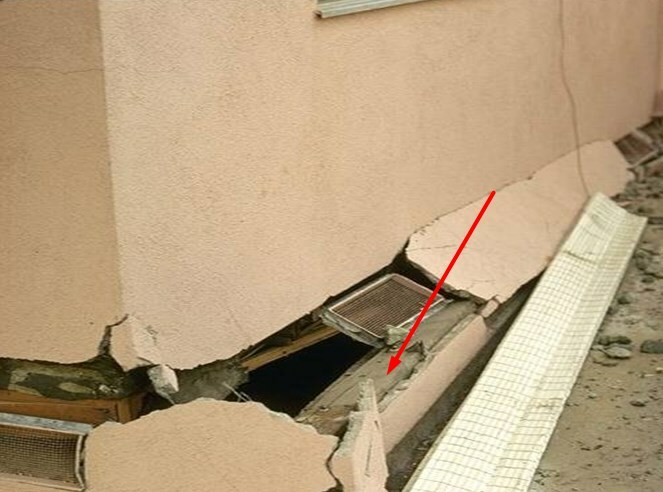 Once that happens it no longer functions as a shear wall and will no longer protect the house. 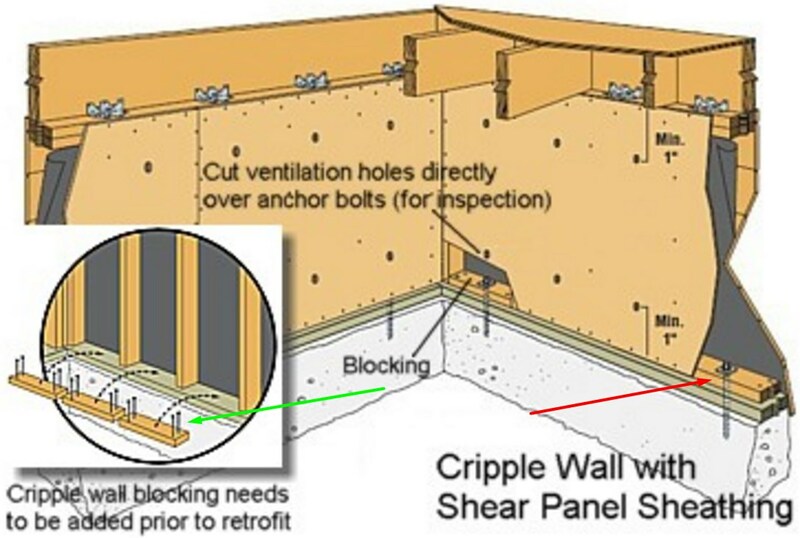 R: Very little shear force will travel to the sections of cripple wall that have no plywood shear-walling. This depends on the existing wall sheathing – stucco in good condition will carry a lot of shear. 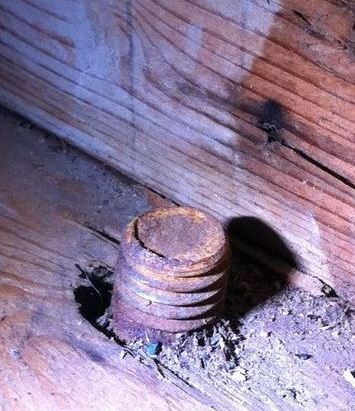 But once the nails have corroded, or failed in an earthquake, it’s not worth much. This means only the bolts located where the plywood is located actually do anything. This is reinforced in this requirement. Bolts outside of braced panels. These bolts don’t do anything and increase cost. 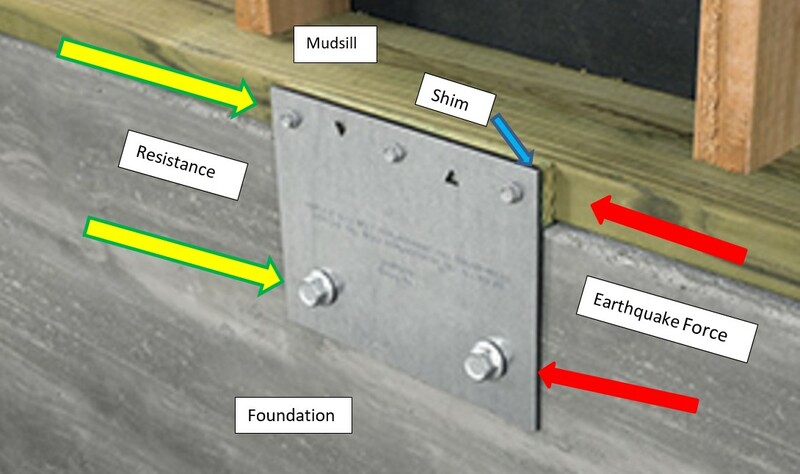 Empirical evidence points to the fact that in actual earthquakes, mudsills do not slide on foundations. Anyone who has removed a mudsill on an older home knows that the mudsill was well connected to the concrete. During construction, contractors could not allow the mudsill to flop around while the house was being built. The carpenters first drove very large nails through the wide 4″ face of the mudsill. Two inches of nail would then be protruding out trhough the mudsill. They then pushed the mudsill and nails into the wet concrete. 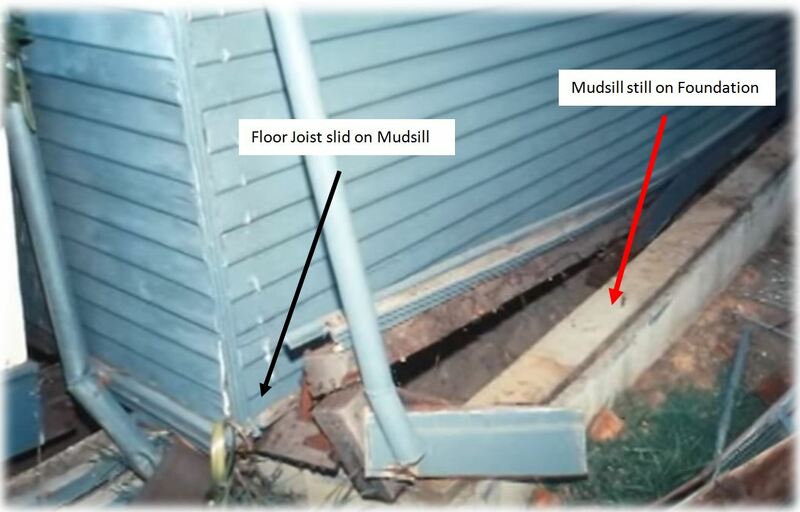 Mudsills are firmly attached to their foundation even if you do not see any bolts. This mudsill does not have any bolts and did not slide. This is absolutely correct. Rather than using existing bolts that always have over-sized holes in the mudsill, use new bolts. 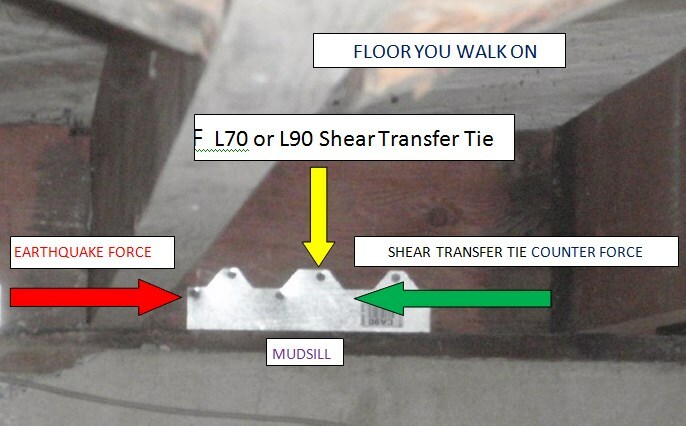 As shown by the red arrow, Standard Plan A puts “angles” (shear transfer ties) above she shear walls between joists. The shear wall is going to take all of the force. Properly designed retrofits concentrate bolts and shear transfer ties at shear wall locations. Standard Plan A recommends galvanized nails in ACQ pressure-treated lumber. 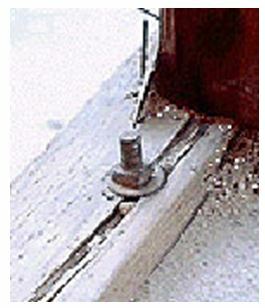 Tests done in New Zealand showed hot dipped galvanized nails deteriorate in ACQ lumber. Let’s deconstruct this chart and discover the engineering behind it. 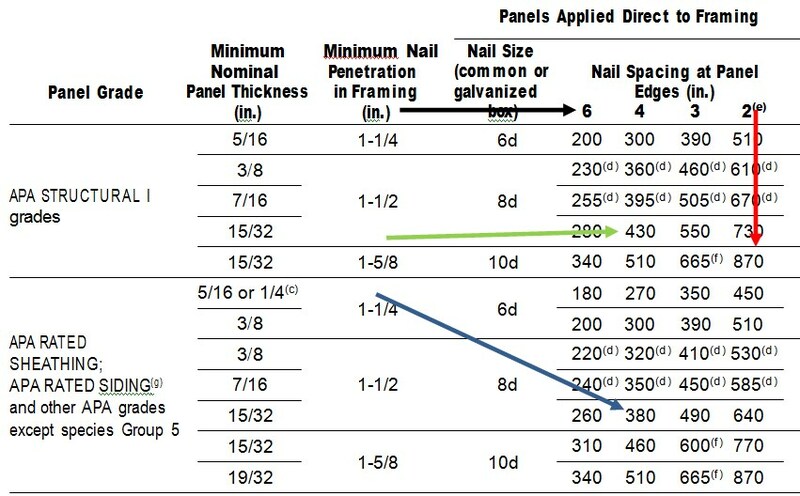 Standard Plan A uses rated plywood nailed with 8d nails 4″ apart on the edges which can resist 380# per linear foot. 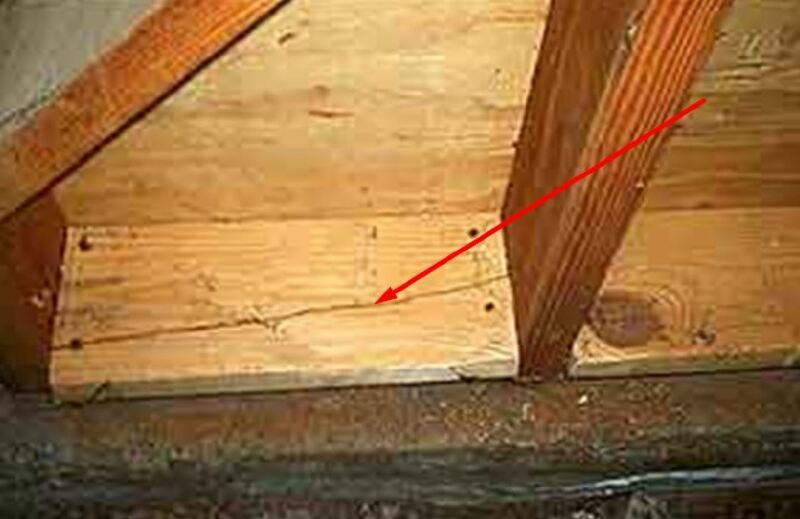 22′-8″ of plywood nailed like this can resist 8,645# This means the committee concluded a house built like this must resist 8,645# of earthquake force on each side and the bolting and shear transfer ties connections should all resist this same amount of force at a minimum. 10 linear feet of Structural 1 plywood nailed with 10d nails 2″ apart can resist 8,700# pounds of force. A difference of 12′-8″ of plywood required. In other words, on each side Standard Plan A requires 12′ 8″ more plywood than needed on each side. Putting up plywood is much more involved than nailing up plywood A great deal of labor intensive framing is also required. This added plywood adds greatly to the expense of a retrofit. The 2″ nailing compared to 4″ nailing represents an insignificant increase in cost. L90 and H10 (H10AR) hardware. Standard Plan A requires 15 pieces L90 hardware on each side. When using a capacity of 600 pounds of resistance per piece Standard Play A this connection will resist 9,000# of force. When using the actual capacity of 925# we only need 10 pieces and achieve 9,345# of resistance on each side. Standard Plan A requires 15 pieces H10 (H10AR) hardware. Using the 505# value this hardware can resist 7,575# IF THE CORRECT NAILS ARE USED, which is actually less than the 8,645# value we need. For the system to work we should add 3 more pieces of H10 hardware. The actual value for modern H10AR hardware (which is what a homeowner or contractor would end up buying) is 490#. If the correct nail is used 15 of these can resist 7,350# which is even less than the 8,645# value we need. To get the 8,645# we also need to add 3 pieces of H10. Standard Plan A has unnecessary bolting. The provision below found in Standard Plan A is the exact requirement for new construction. 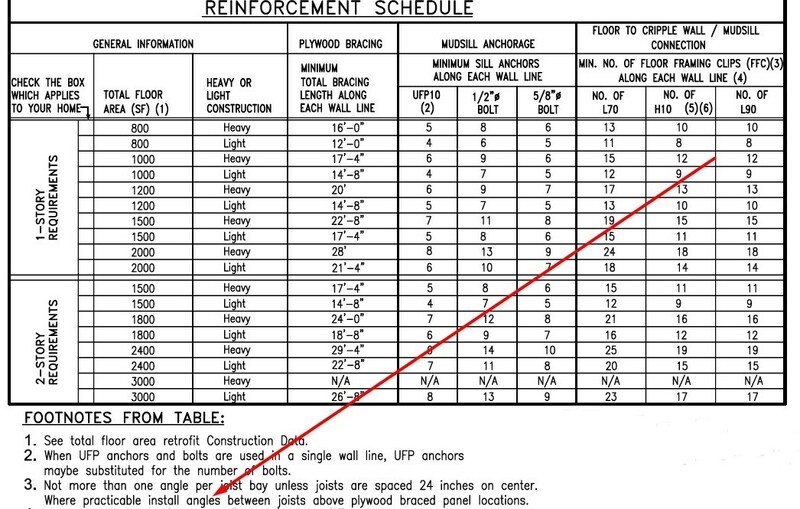 A basic engineering fact is that only the bolts at plywood locations do anything and they should be equal in capacity. 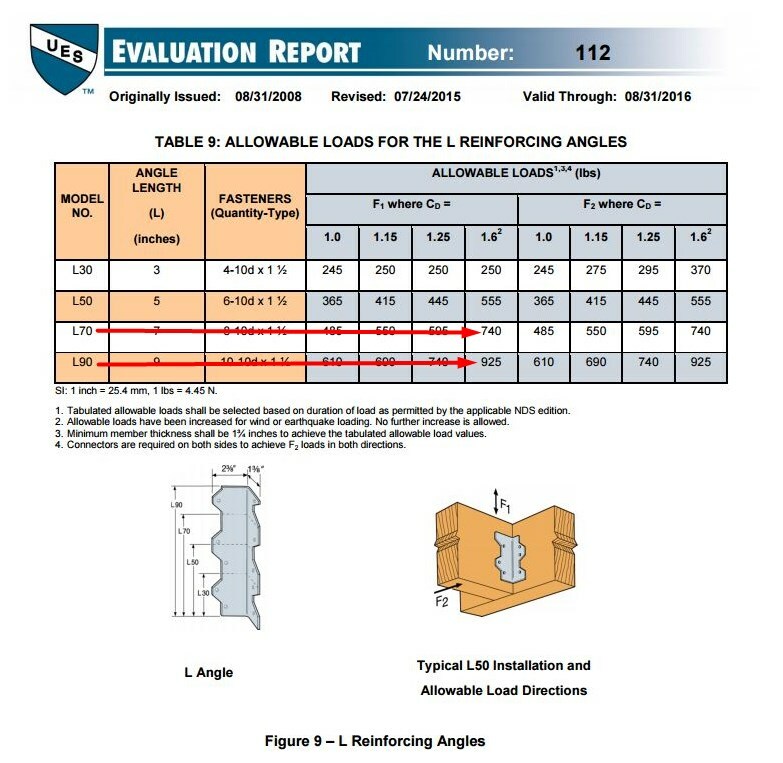 In other words, if you have linear footage of plywood that can resist 2000# of force you need bolts connected to it that can also resist 2000# of force. Any bolts beyond that are a waste of money. Standard Plan A requires bolts 32″ apart where the plywood is AND extra bolting 6 feet apart PLUS bolts on either end of each piece of mudsill. This adds tremendously to the cost of the retrofits. Here is a comparison between two retrofits using the engineering goal of providing 8,645# of earthquake resistance on each wall line. I will leave it to your imagination to figure out the probably cost differential. It uses the outdated 2001 California Building Code. 4 feet is the maximum cripple wall height it addresses. 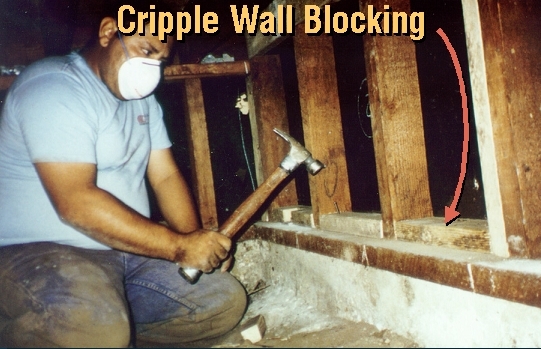 The laws of physics and science make no distinction between cripple walls 10″ or 10′ tall. Standard Plan A omits a type bolting hardware of that in many situations is the only ones that will work. Two other shear transfer ties, the LTP4 and A23 are often the only option. Standard Plan A does not allow for this hardware, such that many contractors end up doing nothing at all when this hardware is required. Standard Plan A specifies the wrong nails for this H10 hardware. Standard Plan A bases its plywood strength on a table in the 2001 California Building Code which is no longer valid. This value is 1/2 that of the current building code. 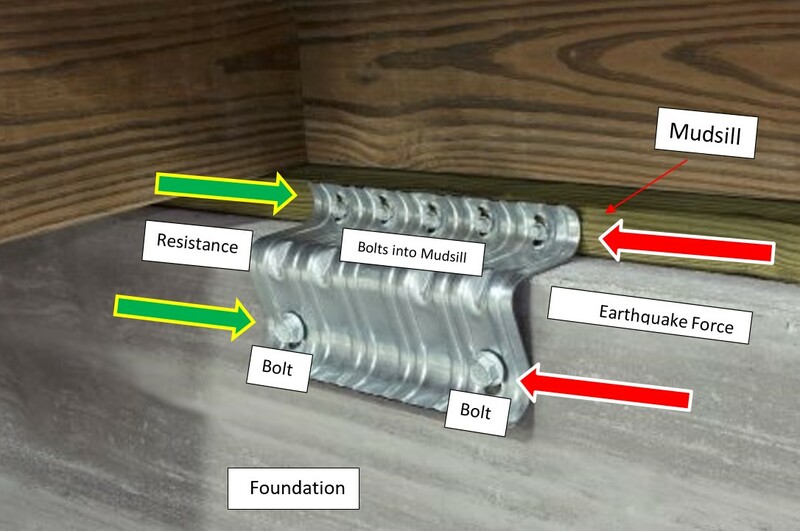 The strength values specified for foundation bolts are inaccurate. They are actually much higher. 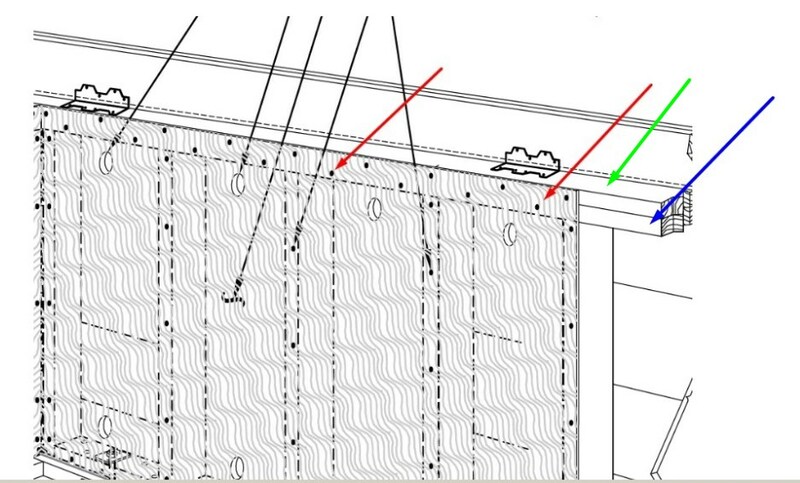 Standard Plan A uses the questionable Nailed Blocking Method for shear wall construction. Standard Plan A bases its plywood strength on a table in the 2001 California Building Code which is no longer valid. This 3 inch thick framing requirement is no longer part of the building code . 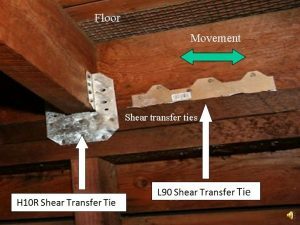 This change means retrofit shear walls can now be built according to code using standard 2 inch thick framing with a resistance of 870 pounds of force per each linear foot of plywood. In other words, with the current code one can put in half the plywood and get over twice the strength. The cost of a designed Plan Set A retrofit compared to custom designed retrofit using the base shear formula. Standard Plan A uses outdated and weak bolting hardware. Standard Plan A leads to a greater expense. It allows plywood not made for earthquake resistance. The nailing of the plywood is insufficient and weak. Hardware is specified with the wrong nails.